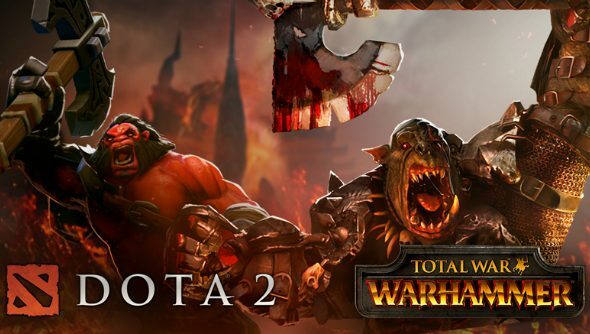 In another move signifying the continuing cross-pollination of fantasy RPG universes the Dota 2 Workshop is now accepting Warhammer-themed contributions. Feel like getting into Dota now that your favourite axes and warpstone flails are going to be there? Here are the best Dota heroes for beginners. Weapons and armour sets from the Warhammer Fantasy Battles universe will now be allowed on Valve’s user-submitted and user-voted marketplace of cosmetic items to add to the MOBA. A selection of the most popular designs taken from Games Workshop’s originally tabletop miniature designs will be added to a treasure for purchase in-game. Submissions will be taken until 10am PDT on August 22, with the treasure arriving on the Dota 2 store September 1. “Because Warhammer’s aesthetics are similar in spirit to much of the Dota universe, we are looking forward to seeing all the content that Dota 2 Workshop artists create for fans in both communities,” Valve wrote in the announcement today. As an additional cross-bridge of brand synergy, anyone pre-purchasing Total War: Warhammerthrough Steam –due out on May 24 – will receive one of the treasures upon its September release.